Escape games are fun and all, but don't you think they're best when they have the constant threat of painful demise? Kotorinosu is back for more with The Dangerous GEN-KAN 2, which, just like the original game, is packed with death everywhere you look, but don't worry... if you explode, fall to your doom, or otherwise become dearly departed, you can always just hit retry and be booted back to before your little... accident. See, you're locked in a place filled with danger both obvious, and, eh, trial-and-error, and finding a way out means figuring out what puzzles you need to solve, and what's just a big fat lethal red herring... when used incorrectly. Just click to navigate and interact, click an item in your inventory to highlight it for use, or an item's question mark to view it up close. The Dangerous GEN-KAN 2 is less about your typical "use screwdriver yonder" point-and-click puzzling, and more about deciphering clues and the proper order in which to approach things, while at the same time trying not to be electrocuted. There's no changing cursor to mark interactive zones, but at the same time, the incredibly smooth and clean presentation usually means you won't encounter any sort of pixel hunting if you have an eye for detail and remember to check under and around everything. In any ordinary escape game, being stuck on a puzzle might sting enough without it repeatedly killing you for your trouble, so some players may find it extra frustrating. There are a lot of items and perspectives tucked in places you might not instinctively think to look, and some of the item uses are a little clunky. At the same time, however, The Dangerous GEN-KAN 2's gleefully malicious puzzle design tends to be tricky in the best possible way in most cases, and the spark of satisfaction you'll feel as you work to progress and figure things out makes the game stand out from the pack. It's all fun and games until someone loses an eye, but where The Dangerous GEN-KAN 2 is concerned, even a little loss of limb counts for a good time. Thanks to Omonom for sending this one in! The Dangerous GEN-KAN 2 Walkthrough now available! Note that most of the codes in this game are randomly generated, so the walkthrough can't give you all the answers. I'm going to assume you know enough to take stock of your surroundings before you start, so I won't be telling you things like "turn right twice" - I expect you to know where the fan view is without being told. Get the S from under the book on the side table. Note that the bottom drawer needs a key, and the top drawer is secured with a screw on the side. Look at the book for a clue that doesn't make any sense yet. Look under the couch cushions. There's a button with a letter written around it four times. (Which letter it is changes from game to game.) This is the first of the six letter buttons you need to find. Above the couch, there's a compass rose with shapes. AFAIK, this clue doesn't change game to game: North = circle, East = diamond, South = square, West = X. Look at the hand on the right. It needs a thin poky thing to open it. Look at the hand on the left: you have one of the missing buttons. Put it in place and press it. Get the note that was wrapped around the index finger. Look at the box on the coffee table. Compare it to the note you just got and the picture above the couch. Set the dials according to the clue you got (it will be different each game). If your note has a combination of shapes - say, an X in a circle - then point that dial at the direction in between those two shapes - in our example, northwest. If you did it right, you'll get a part of a key. If you did it wrong, you'll blow up. Turn around until you see the vertical bars. Look in the bottom right corner of the barred doorway and get the big metal plate. Look at the button in the middle of the bars and note the letter. Turn back to the couch view and click to the left of the couch. Put the metal plate on the trapdoor, then look in the nook on the wall to get the blue gloves. Turn to the fan view. Look at the big plug below the fan. Using the gloves, pick up the plug and get the metal piece. Then, click the socket on the left to plug in the fan. Combine the metal piece with the key part to get a complete key. Use it to open the wall cabinet to the left of the couch. Get the lollipop and the red handle. Note the letter button behind the books on the lower shelf. Look at the hint in the red book on the upper shelf. Turn back to the fan view. After double-checking that the fan is on, look at the poison canister. Put the red handle in the top and turn it. Get the lighter. Use the lighter on the lollipop (this was one of the hints in the red book in the wall cabinet). Use the resulting screwdriver to open the top drawer of the side table. Get the soda bottle and the P.
Use the P on the hand to the left. Get the ring. Examine it and remove the stone. Look at the trapdoor nook again and pull down the chain. Use the ring-sans-stone to secure it to the loop in the floor. Put the stone into the wall plate above the poison canister to turn off the lasers. Go look at the plant. Get the fork. Go back to the fan and unplug it (don't forget to use the gloves). Look at the fan and find the four little holes on the right of the frame. Use the fork to open the grating. Get the faucet knob. Manually turn the fan blade until you match up the numbers. (Clue will change each game.) Note the numbers and their locations. Look at the cabinet under the sink. Press the buttons in the order indicated by the fan, then press the middle button. Note the letter button on the right. Pull the chain on the left. Look at the trapdoor nook again. Get the baseball. Go towards the plant until you can see the dark hole in the ceiling. Click it to see something glinting up there. Throw the baseball at it, then get the heck out of the way. Retrieve the baseball and the hex wrench. Use the wrench to remove the door to the right of the vertical bars. (Don't leave the bottom nut for last, because the door will fall on you and crush you.) Note the letter on the fallen panel. Put the nuts from the door panel into the leaky pipe under the wall cabinet. Tighten them with the wrench. Go to the sink. Put the faucet knob in place. Turn on the water and fill the soda bottle. Turn off the water and empty the soda bottle into the sink. Get the key from the bottle. Use the key you got from the soda bottle to open the bottom drawer of the side table. Pull the handle down. The handle caused the compass-rose picture to fall off the wall and reveal a scary face. Retrieve the picture from behind the couch and look at its back. Get the thin poky thing. Use the thin poky thing to open the hand on the right. Press the P button to cause it to drop the pencil. Use the pencil on the Memo page of the green book on the side table; click the page you just scribbled over to tear it out. Look at the page you tore out of the book. Note the hand positions, and note which hand it is (by looking at the thumbs). Press the corresponding buttons of the corresponding hands, in order from left to right. Look at the scary face and press the button below it. If you pressed the buttons right, you get a knife. If you got the buttons wrong, you get eaten. Use the knife on the baseball. Get the red key. Use the red key to open the safe (where the screwed-in panel was). Note the letter button on its door. Quickly go around the room and press the buttons to spell SAFETY, in that order. Enter the door that opened where the "SAFETY" sign used to be. Wait for the explosion. (If you've got your sound turned off, the screen will go white when the explosion happens.) Click the door to open it, then go towards the sliver of light until you leave the wreckage. Click to enter the room. Click the table on the right. Lift the book. Take the "S" button. Click the hand on the left. Place the "S" button in it's place. Click it. Take the piece of paper wrapped around the index finger. Look at the red painting on the wall. Note the locations of each shape. Using the paper and the red painting, open the box on the coffee table. It's randomized every game. When there are 2 shapes, choose the direction that is between them. Turn around and look through the bars. Take the metal grating. Turn back around and put the grating over the trap door left of the couch. Take the gloves from the hole. Turn right. Use the gloves to lift the plug. Take the other key half and connect the plug to the receptacle. This will turn the fan on. Turn around. Connect the 2 key halves. Use the key on the wall cabinet. Take the lollipop and handle. Note that the red book explains a couple of obvious things. Turn around. Use the handle on the purple poison container. The fan will dissipate the poison. Take the lighter. Turn left. Use the lighter on the lollipop. Use this stick on the side of the table where the arrow under the book points. Open the top drawer. Take the "P" button and the bottle. Click the left hand. Place the "P" button in it's place. Click it. Take the ring, examine it, and separate the stone from the ring. Click on the hole left of the couch. Use the ring to attach the chain to the latch. Turn right. Use the stone from the ring in the panel on the wall. This will deactivate the lasers. Click the plant. Take the fork. Back out. Unplug the electricity (don't forget the gloves). Use the fork to open the fan cover. Take the sink handle. Rotate the fan until you can read the 5 numbers. Note their positions. Go to the sink. Click the cabinet. Press the buttons in the order indicated by the fan. Pull the chain down. Back all the way out and turn left. Go to the hole left of the couch. Take the baseball. Turn right. Enter the doorway. Look up at a hole in the ceiling. Throw the baseball, then quickly step back. The ball and a wrench will hit the ground. Take them both. Back out and turn right. Use the wrench to remove the bolts on the door. Turn right. Use the bolts on the pipe below the cabinet. Use the wrench to secure them both. Turn around. Go to the sink. Use the handle on it and turn on the water. Fill the bottle, then turn off the water and empty it. Take the key. Back out and turn left. Use the key on the bottom drawer of the side table. Flip the switch. Take the red painting behind the couch. Examine it, flip it over, and take the pin. Click on the right hand. Use the pin on the left corner. Press the "P" button to open the hand. Take the pencil. Click the side table. Click the book to lift it, then click it again. Note the left side to identify which hand position corresponds to rock, paper and scissors. Use the pencil on the right side to reveal a clue. Click the page to tear it out. Follow the clue on the page, click the buttons on the corresponding hands. Take note of the thumb positions to determine which hand is which. The code is randomized each game. Once you have entered the correct code, click the button below the giant face. It's mouth will open and it will drop a knife. Use the knife on the baseball and get a key. TUrn around. use the key on the small door. Press the buttons in order, spelling out S-A-F-E-T-Y. Upon pressing the last button, all the buttons will glow. A door will appear where the green "safety" alcove was. Enter this door, let it close behind you, and wait for the bomb to go off. Enter the room. Exit the room through the doorway where the light is shining. You're out! Trying to open the coffee table box without entering the correct code. Standing on the trap door left of the couch and looking in the hole. Touching the plug without gloves. Opening the poison container without turning on the fan. Trying to walk past the lasers. Getting hit in the head by the wrench. Getting eaten by the giant face on the wall. Turning on the sink without fixing the pipe. Being in the room when the timer on the bomb reaches 0. I have a pair of gloves (already used on the electrical thing) and a lollipop (already tried to eat it, did not go well). I've opened the box on the glass table and the cabinet on the wall, and now I'm stuck. I can't seem to find the P for the rock, paper, scissors thing. I found the handle for the container of poison but I can't open it because it's full of, you know, poison. have no idea what to do with the baseball or bottle with the red cube in it. using that item on the 3 keyholes,without sucess.I also tried using it on those holes in the vent.No sucess. I was stuck there for a while. There was one item I missed when looking about the room. the platform to the lower right of the door you came in. You need to combine the tooth part of the key with something else before you can use it. the gloves do nothing to protect me from the purple poison. Oh, wait, I got it now! I didn't realize I could plug the electric thing in to turn on the fan. I assume I should have died to the poison jar,but I didn't.I had the handle on its place,but I didn't used the gloves.They were on my inventory,and I could get the item inside.Now I have the P square. Anyone figured out what to do with the grey face on the wall and its button? So,I managed to do some few stuff. You can turn the fan off.And mannualy rotate it.If you do it,you will discover something...interesting. using the baseball on the roof hole? I'm horrible at this. I have a piece of paper with the shapes on it...any help? use it on the box on the glass table. Look at those shapes.They aren't familiar to you? Try looking on your surroundings. Maybe somewhere on the wall? That red painting in the wall is related with the paper and the box on the table.Try finding the pattern between them. Wow! Out but not even going to attempt a walkthrough. That cube is dissolved by water,so you really need to fill the bottle. However if you turn the water on,after acquiring the handle,the room will flood. Maybe because that pipe is broken.You should fix it before filling the box with the water. I always look forward to new games from Kotorinosu, and this one did not disappoint. 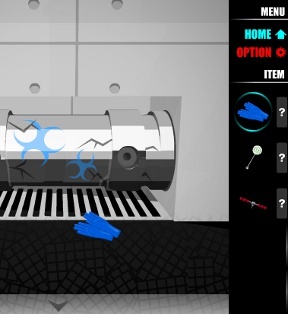 It had just the right amount of difficulty, and a perfect balance between puzzles and use of found objects. I've been feeling lately like the escape game genre has been a little lacking, but this game was a breath of fresh air. Objects: baseball,handle(screwdriver?I'm foreigner,dunno what is the name of it),paper of the rock-paper-scissors and the knife.I miss the button with "S",so I can leave pressing them in order.Any help? There seems to be no place to use one of those. predated, if I press the button, where the picture on the wall was. A little help would be very appreciated, thanks! Did you pay attention to the way the hands in the clue were oriented? In particular, watch the thumbs. Look at book you tore the page out of. The example ones are all from the same hand. Once your done, you need and enter button. tear the page out of the book? To begin with, which book are we talking about - the one in the wall cabinet, or the one on the side table? I did a double take myself when I first noticed this review. This one is titled "The Dangerous GEN-KAN 2" and the other one is titled "Dangerous GEN-KAN 2." The difference is in the article, I guess. Okay, I got it working. I changed my Flash settings to allow it however much memory it wanted. And both walk-throughs indicate this is no big deal. What am I doing wrong? It is not under the sink. It is somewhere else and you have likely already seen it. I liked how it all came together in the final puzzle, but not so much looking for a corners and areas of the room when everything's generally monochrome. If your monitor isn't bright enough, it's easy to miss. The explosion sound was fun. I gave up on the left and right RPS scissors clues. Those drawings need to be MUCH bigger and MUCH clearer. After all that I can't finish it :/ I can't click all green buttons in under a minute. kotorinosu are 'for me' one of the best at room escapes presently, as Nerdypants pointed out, recent games have been a little stale from everyone else. ...oh yes and anyone who says no deaths on their first run is talking nonsense. and a half dozen other incidents I could mention. Yes "ecru" I'm looking squarely at you when I say that. most intuitive death. Makes sense to me, since rubber doesn't conduct electricity and the electrical device had one of those danger symbols on it. on the ring you have to click about 4 times to get the stone. And there aren't any red herring items or places to click (except the ones that kill you, but those have specific ways of dealing with them later), which are truly annoying. I love this game! threw the baseball and got out of the way. It just stopped. I can pick up the baseball and the wrench nor can I move to another scene. I CAN'T pick up the baseball and wrench. Definitely a bug. I reloaded and didn't have the baseball. So I got again and I tried to use it again and the same thing happens. It just stops. I can't pick up anything nor move to another scene. it breaks. No picking up anything no changing scenes just nothing. Only got to playing this now, but I escaped! (after I found some items with the help of the walkthrough). Did you try the game in a different browser? I played it in Firefox just fine. If you unfasten the bottom screw on the door last, you get crushed by it when it falls. i apologize ahead of time about this, as it does pertain to a kotorinisou game but it's the Mirror game. lately it seems to have been configured so the inventory is hidden, as i can no longer access it. Does anyone have this issue? it does this in both Google and IE web browsers. Please help. Maybe there's a better alternate link i can use. I see exactly the same thing, Paul. (I posted a comment to that effect on the actual Mirror Escape thread.) The only thing I can suggest is to go to Kotorinosu's website directly, and find the game there. For some reason, I can't turn on the tap in the sink. I've already..
..secured the bolts on the leaky water pipe and put the handle on the faucet. but nothing happens when I click on the tap handle. Help!